He characterizes his age as “a sea of racial, religious and national tensions,” and went on to say there are “deep strains in the soul of a people, for which there is no preparation and from which there seems no sure basis for recovery.” He characterized his era as one of restlessness, irritation and an unwillingness to take responsibility and fulfill obligations. When I read those words recently, I was struck by how clearly and poignantly they described the age we are living in now: urgency, instability, strain and restlessness. It seems as if each day brings news of another instance of violence, bigotry, hatred, hypocrisy, and accusation, from which there is no respite or relief. When Thurman reflected on his era, he was not talking in superficialities or solely personal terms. He was talking about a world that had just unleashed the H-Bomb destroying two Japanese cities;, he was reflecting on racial tension that left black men hanging from trees; he was interacting with returning soldiers wounded and traumatized by a world war. While Nazism had been defeated, Communism had emerged in Russia and China, and nations long oppressed by colonial regimes were rising up to demand liberation. The future was uncertain, unpredictable, and threatened by nuclear annihilation. Thurman called the restless souls in his restless society to look for hope and stability in God. He wrote: “To the [person] who has found rest in God, there comes the strength to reduce all the ill-at-easeness to manageable units of control, making for tranquility in the midst of change and upheaval.” His words echoed the words of the Psalmist who proclaimed in another restless time: “My soul finds rest in God alone; my salvation comes from God” (Psalm 62.1). As I reflect on these words of Thurman and the Psalmist, I experience an inner calm, realizing amid the current chaos and restlessness all around me there is a place of rest and respite. Yet just as quickly, that awareness of inner rest prompts another thought: that this divine rest stirs in me a divine restlessness to engage the injustices and evils in the world, and where possible to make changes that bring hope and healing. Too often words like Thurman’s are used as reasons to retreat from the challenges and struggles of the world, to try and remove ourselves in an act of transcendence. This way of religion is an escape, a removal of oneself from engaging the world. However, it occurs to me this is not the purpose of the rest God provides. God’s rest is given so that we might continue to be restless for the loving grace of God to be reflected in our relationships, our economy, our politics and our civic life. The rest God provides opens us up to the Spirit’s restlessness for the world to be a more humane and caring place. Howard Thurman was not a person to use his faith as an escape, as a hiding place from the world’s pain; quite the opposite. 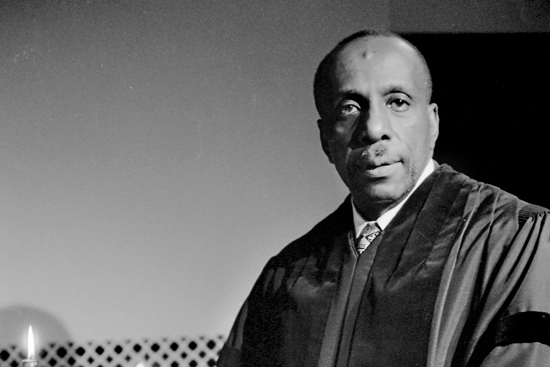 The arc of Howard Thurman’s life caused him to engage the deep pain and struggles of his age. As a young African-American man growing up in the segregated South, as a mentor to a young Dr. Martin Luther King, Jr., as co-pastor of the first intentionally racially diverse church in a racially segregated age, and as the first African American chaplain at Boston University, Thurman did not withdraw and hide from the ugliness of his age; he challenged and sought to transform it. And so too, it seems to me, that the rest I can find in God is a place to get in touch with the deep stirrings of the Spirit, stirrings that long to disrupt the status quo in the name of freedom, equity, inclusion, and justice for all persons whatever their race or culture or economic standing or orientation or citizenship status or gender. God invites us to a place of rest, in the same way, Jesus called his disciples to come aside in rest – so that we can return empowered, emboldened and equipped to make God’s presence and reign visible and more fully known in our homes, our communities, our society, and our world. This is the restlessness paradox – we are given a place of rest in God’s grace and Spirit, so that in turn we may be continually restless to see God’s world made whole.